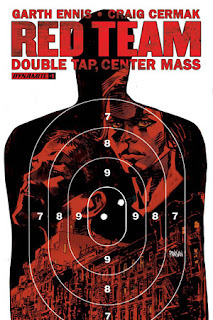 The Fellowship was fortunate enough to obtain a copy of RED TEAM: DOUBLE TAP, CENTER MASS #1 from Dynamite Entertainment. Garth Ennis writes, Craig Cermak draws, Vinicius Andrade colors, and Rob Steen letters. It’s been a year since it all went down. A year since they saw their friends die. Eddie and Trudy walked away, but it really hasn’t left them. And the department still doesn’t really trust them, so they get crappy duty like waiting for a low-rent hood to come home so they can bring him in. But that’s where it gets weird, with a rich kid pulling some crazy driving with a whole lot of interesting surprises in his sweet ride. RED TEAM was one hell of a great piece of storytelling. And now Ennis has gotten the band back together to bring us volume 2, which in issue one is already proving to be a great cop story. Like most cop stories, there’s a lot of talking going on, but it reads so smoothly you’ll hardly notice. And besides, it gives us plenty of opportunity to enjoy the fantastic face work in the book. Eddie and Trudy really are good cops, despite their past mistakes. And the detail in the art in this book is phenomenal. You’ll want to get on board for this ride. RED TEAM: DOUBLE TAP, CENTER MASS #1 is available now at your FLCS or at dynamite.com.